I went to see Band of Horses about a year ago at the newly opened Fox Theater in Oakland. The show was sold out and the crowd was a pretty interesting cross-section of people — slightly more “Marina” than I was expecting, and perhaps a little more “belly-shirt” than I was comfortable with. But when the band hit the stage, all eyes were averted from the bejeweled midsections of their neighbors to the night’s main attraction. The band played well — really well. Note for note it almost sounded as if someone was blasting its last two albums (2006’s Everything All The Time and 2007’s Cease To Begin — both released on Sub Pop) on a giant stereo system as opposed to plucking each note on actual instruments. I don’t think I have ever seen a more polished act, though I did yearn for an impromptu guitar solo or vocal breakdown that differed — even slightly — from their recorded material. Apparently, when front man and only original remaining member Ben Bridwell geared up to record their latest release Infinite Arms after three solid years of touring and the birth of a daughter, he was ready for a change. Their contract with Sub Pop was up, he was finally settling into the new lineup of musicians hand-picked through the years on the road and in the studio, and what the band desired was to record an album without restrictions, limitations or any sort of impedance from outside sources. Bridwell decided to fund the album himself and to take the reigns, along with the rest of the band, in the producers seat. The result is relatively subtle though definite and certainly redefining. There is less of a sense of urgency around each song and more of an allowance for the listener to relax into the conceptual and thematic direction of each track. Band of Horses was pretty darn fluid before but now the band sounds like a river of honey flowing through a mountain of chocolate in the land of Do As You Please. To go with the over-used “the band has really come into themselves and their sound” does not do the transformation on Infinite Arms justice. Perhaps it has more to do with Bridwell being driven into bankruptcy by the lengthy recording sessions and having to quite literally take the show on the road to pay the bills, while, in the process, ironing out the creases in the newer material before it was committed to tape. Regardless, Infinite Arms is an absolute pleasure to listen to. From the opener “Factory” with the reverb drenched percussion and the gentle sway of the string arrangements, to the expansiveness of “Compliments”, to the obscenely catchy “Laredo”, the album is strong right out of the gates, and continues as such right through to the anthemic six-minute closer “Neighbor”. What we have before us is the ultimate summer album, I just hope I don’t wear it out before June hits. 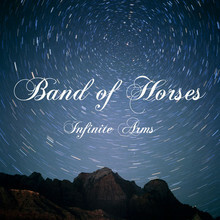 Band of Horses are scheduled to appear at Amoeba May 29th for an in-store performance Amoeba at 6pm. Tickets for the band's show at the Independent later that night are sold out.